Thanks for inviting me to your blog, Suzy. I’m so happy to be here! 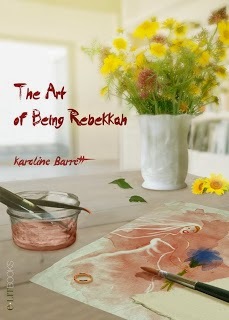 Today, I’m talking about the story behind the title of my women’s fiction novel, The Art of Being Rebekkah. Usually, when I write, the title of whatever it is I am writing is pretty obvious to me. I’ve never had a problem naming my short stories; in fact, they usually name themselves before the story itself has even started. The Art of Being Rebekkah started out as a short story that was never published. I don’t even remember what I called it back then. When I decided to expand it into a novel because I wanted to see where my characters ended up, I called it by the imaginative name of Novel. Brilliant, no? This book was different. It refused to name itself! I wasn’t too worried though, that I hadn’t a title for it yet, I still had a long way to go before I typed The End. Especially since I had to startNovel over at the beginning when I reached Chapter Fifteen and realized I had no idea where my story was going, or where it was even supposed to go, and my characters were not who I wanted them to be. I had lots of time. My reaction to all of these was an unequivocal, meh! I wasn’t crazy about any of them. They didn’t fit quite right. Then, a couple of weeks later, my husband and I were on vacation and happened to be visiting the Kurt Vonnegut, Jr. museum when it came to me! The Art of Being Rebekkah, I shouted. Luckily, it’s a two room museum and no one else was there. The title came to me just like that. I loved it! Maybe it was Kurt’s ghost, taking pity on a fellow writer. “Excuse me, Rebekkah Gelles?” a female voice called. Rebekkah turned to see the woman who had been studying her minutes before striding across the store. She waited. Rebekkah shook the woman’s hand. A strange sensation crept down her neck. “He is.” She allowed herself to be guided to a quiet corner at the front of the store. Rebekkah felt oddly detached. She barely registered the bag holding the watch dropping to the floor. It seemed incredible she would run into a woman who claimed she was once married to Avram. Then again, this neighborhood was home to many Jewish people, so maybe it made perfect sense. Only, it didn’t make perfect sense. How had this woman been married to Avram? When? Rebekkah is a complicated woman; the novel is about her journey to find faith, family, love, and herself. She is also a very talented artist. So, the Art of Being Rebekkah has a lovely double meaning, and I think it’s the perfect title! When Rebekkah Gelles suspects her husband, Avram of not only lying to her, but also contriving not to have the children she so desperately wants and embezzling money from his business, she wants out of their marriage. Her life gets complicated when she falls in love with detective Nick Rossi. Convinced Nick’s wrong for her—he’s not Jewish for one thing—she walks away after they share a night of passion. Nick warns her even though he loves her, he won’t beg. Their budding relationship seems to have ended. When Rebekkah finds herself staring at a positive pregnancy test, she wavers between joy and sadness. Motherhood wasn’t supposed to happen this way. She was born in upstate New York and has lived in South America, Indiana, Florida, Pennsylvania, and New Jersey. At the moment, she lives in a small Connecticut town with her husband. When she’s not writing, she loves reading, spending time by the water, traveling, and doing anything that has nothing to do with math. She’s currently working on her second novel, a cozy mystery set in upstate N.Y.